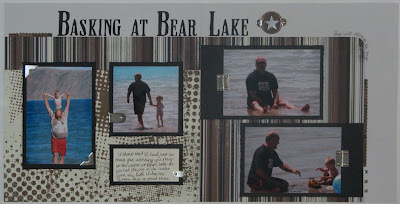 Here is a LO that I created about my husband. I used the scraps from this LO for the card HERE. This was a LO that I created for a challenge at the Apronstrings Designs yahoo board and most of the product came from one of their kits. The challenge for this one was to create a more masculine LO and to use metal embellishments. I used one of Becky Higgins sketches from her new sketch book for this LO. The title was cut with my cricut and the Stamped cartridge.